Measuring and collecting tissue samples from juvenile Murray cod. With the record weight and length for Murray cod standing at 113 kilograms and 1.8 metres, it's not surprising that Australia's largest freshwater fish is a popular target for amateur anglers. Over the course of a lifetime, an individual Murray cod may travel thousands of kilometres. In spring, the fish move upstream, typically no more than 200 kilometres. After spawning, the parents move back to their home territory while the small fry (larvae) drift downstream. It takes roughly four to five years for a Murray cod to reach maturity, with the fish maturing faster in warmer waters. Murray cod is currently listed under the Victorian Flora and Fauna Guarantee Act (which means it is protected to some extent) and is nationally listed under the Commonwealth Environment Protection and Biodiversity Conservation Act 1999 as vulnerable. Some of its close relatives, including the Mary River cod, the eastern freshwater cod and the trout cod, are considered endangered. Reasons for the decline of these species are not clear, but contributing factors may have included river regulation for irrigation, hydro-electricity and flood mitigation, removal of woody debris that might otherwise provide shelter, pollution, competition from introduced species such as carp and redfin, and overfishing. Since the early 1980s, restocking programs have been conducted by state government agencies and recreational fisheries groups in New South Wales, Victoria and Queensland. In total, these programs have released more than 11 million Murray cod fingerlings produced from broodfish caught in the wild and spawned in captivity. Most of the fingerlings have been released into impoundments and weirs within the natural range of the species in the Murray-Darling Basin. The last fishery based on Murray cod caught from the wild closed its doors in 2003, ending around 120 years of large-scale commercial fishing which had been predominantly based on the Murrumbidgee and Murray rivers. But there is hope. The fish's reputation, good eating quality and ability to live in high-density conditions without becoming territorial are the basis of a newly emerging Victorian aquaculture industry. Surveys conducted by the department in key Asian markets suggest that the fish could have export potential — provided it can be produced at the right price and in the right quantities. The case for maintaining sufficient numbers of the fish for recreational fishing as well as conservation purposes is strengthened by the fact that recreational fishing is a significant contributor to the Victorian economy, estimated at $1.26 billion for all species in all regions. A preliminary study by the Victorian Department of Sustainability and Environment (DSE) indicated that Murray cod from some southern and eastern catchment areas had significant genetic differences. This may reflect the way in which the fish has adapted to improve its chances of surviving in different environments. DSE researchers reported to the Department of Agriculture, Fisheries and Forestry that some of the Murray cod released into Victorian catchments in one year were not genetically well-matched to the wild populations into which they were introduced (Bearlin and Tikel, 2003). Prior to Our Rural Landscape, which commenced in 2003, scientists at DPI Attwood developed an enriched DNA library for Murray cod and identified a small number of microsatellite markers. Microsatellite markers are short repetitive stretches of DNA that are inherited from one generation to the next. They are useful for assigning parentage as well as for detecting genetic differences between populations and therefore enabled DPI to embark on the genetic interrogation of this valuable species. The project, which is being undertaken by DPI researchers at the Attwood and Snobs Creek centres forms part of Our Rural Landscape, a DPI initiative worth $50 million over four years. The project draws on DPI capabilities and research experience in animal genetics, and fisheries management. The Attwood group is conducting animal genetics and genomics research for the dairy, beef, sheep, pork and abalone industries; it has built up an impressive collection of genetic material as well as expertise in molecular genetics and bioinformatics. The Snobs Creek group has a long history of fisheries and aquaculture research, and has played a key role in the development of captive breeding and production techniques for Murray cod and other native fish species. Our project 'High value aquaculture in sustainable rural landscapes' aims to develop genetic and reproduction technologies to produce new domesticated strains of Murray cod for aquaculture and support the management of wild Murray cod populations. Better knowledge of Murray cod population genetics will establish the extent of genetic diversity in current and historical Murray cod populations, so that the future wellbeing of this important species can be better protected and managed through effective and genetically-sound stock enhancement programs. Selective breeding of Murray cod for aquaculture is based on the identification of genetic markers for useful production traits (such as disease resistance, good flesh texture, and rapid growth). Elite strains of Murray cod can be grown in recirculation systems, or in 'open water' systems in large irrigation dams, which are now a feature of the landscape in northern Victorian horticultural regions. This enables value adding of the water through fish production, before application to grape, fruit, and vegetable crops. 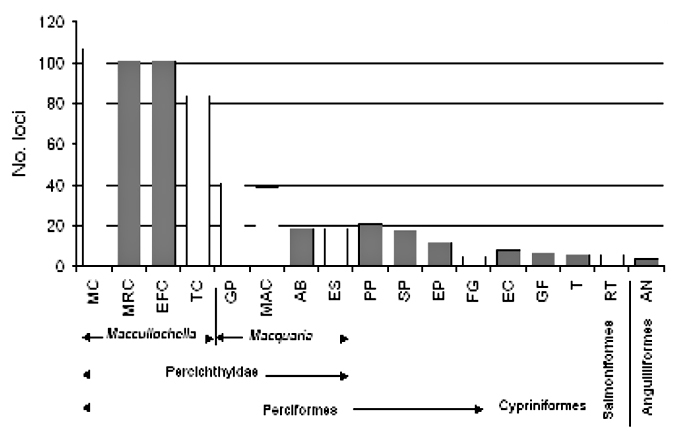 Crossamplification of Murray cod unicrosatellite markers in other species of fish. Project staff have obtained more than 700 contemporary tissue samples of Murray cod from 19 river catchments, as well as 300 historic samples (fish scales) collected from six river catchments between 1948 and 1978. 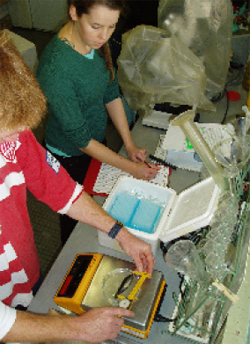 Several state fisheries agencies have assisted with the collection of Murray cod tissue samples from across the Murray-Darling Basin (MDB): DSE, New South Wales Department of Primary Industries, Queensland Department of Primary Industries and Fisheries and Primary Industries and Resources South Australia (PIRSA). Recreational angling groups have also helped with the collection of samples. The Holsworth Wildlife Research Fund and the NSW Recreational Fishing Trust have assisted by providing funding for sample collection and analysis. Meaghan Rourke, a DPI researcher who is currently studying for her PhD through Monash University, has developed a method for extracting DNA from fish scales and applied this to current and historical Murray cod fish scales. Analysis of the contemporary genetic population structure of Murray cod across the MDB has revealed up to six populations. Fish from the Lachlan and Macquarie River catchments each represent a discrete genetic cluster, while fish from the Border, Namoi and Gwydir River catchments show a slightly lower degree of differentiation. 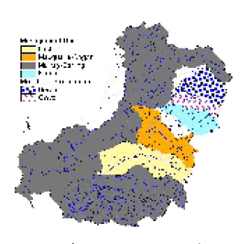 Fish from other MDB catchments are apparently one large panmictic population. Temporal comparisons between the historical scale samples (up to 50 years old) and contemporary samples from five southern MDB catchments has demonstrated limited change in genetic structuring, suggesting little genetic impact of restocking Murray cod in these areas. Around 15 of the DPI microsatellite markers have been used to determine the parentage of larvae spawned in holding ponds containing broodfish (mature fish in captivity) of both sexes. So far around 45 spawnings (also known as families) have been tested, representing three spawning seasons. Murray cod management units (unique populations) in the Murray Darling basin. Based on anecdotal observations of spawning fish in the wild, Murray cod were widely accepted as a monogamous species and were also thought to spawn once per season. The results to date from the broodfish studies confirm that Murray cod are generally monogamous, but the researchers were surprised to find that up to 12% of spawnings were the result of polygamous spawning events involving two females and one male. Other unexpected findings were that some fish spawn at least twice per season and some pairs spawned together over several seasons. However, these findings may not reflect what is occurring in the wild, given that the captive cod are maintained in conditions quite different to wild fish. All this information is important for the long-term management of the genetic diversity of wild populations. For example, managing and optimising the genetic diversity of captive-bred progeny used for stock enhancement programs will require a clear understanding of the genetic structure of wild populations and of the breeding success of individual broodstock, which includes mating patterns and variance in family size. More simply, it may be necessary to regularly replace broodfish with new stock and to obtain broodfish from further afield in order to maintain the required level of genetic diversity. Currently, researchers are using data collected from this study to develop a model to evaluate the effects of different breeding and stocking practices on the genetic diversity of wild populations. This model will assist fisheries managers to implement genetically sound stock enhancement programs. Analyses of the phenotypic traits in the different Murray cod families shows that there is a high degree of variability within and between the families, which when linked with the genetic markers, provides good potential for selecting elite strains of Murray cod for aquaculture production. Further analysis of contemporary and historical Murray cod samples, and refinement of the DNA extraction and analysis techniques, will provide a good understanding of the genetic diversity of Murray cod in the Murray Darling catchments. This information will assist government agencies to develop improved fishery conservation and management practices, including stocking enhancement practices based on a sound knowledge of population genetics. These strategies will help to ensure the long-term survival of Murray cod. Indeed, this approach will form the basis/framework for using genetic and genomic technologies to improve and enhance the management of other important fish species and fisheries resources in the state. These technologies may also be used to identify species that have lower genetic diversity and thus may be less adaptable to environmental variations (ie brought about by climate change). The linking of genetic markers with desirable traits for aquaculture production is the first step in development of elite strains of Murray cod for a rapidly developing industry in Victoria. This project has provided the tools for future commercial selection of Murray cod to supply local and international markets with high value fish.